A mum took to Facebook to warn about the dangers of using safety mirrors and car seats. Every parent’s goal is to keep their kids safe at all times. Yes, you’ve child-proofed your home, but what about your car? Did you know that even objects intended to keep them safe while on the go could actually pose risks? 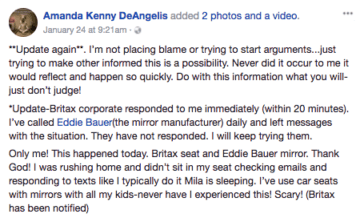 Take for instance, this mum who watched in horror as her baby car seat burned because of a safety mirror. 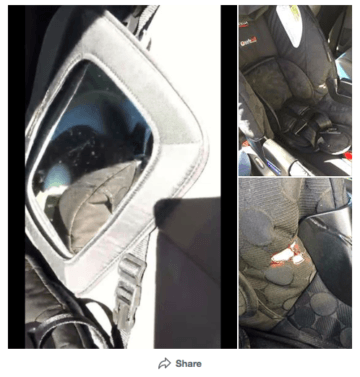 Amanda DeAngelis, a mum from Texas, shared a warning to fellow parents about the possible dangers of products – car seats, and safety mirrors in particular – that are designed to keep our little ones safe. She went on to express her relief that she made a two-second stop at that precise moment. In a series of photos and a video clip which she shared, you can clearly see that the seat’s fabric is burning. Though Amanda had good intentions in sharing her experience, not all were pleased with the post. But others were quick to shame DeAngelis. Some netizens said it was her fault for placing the mirror the wrong way. “It’s not really the manufacturers’ fault. This is a user error,” wrote one commenter. 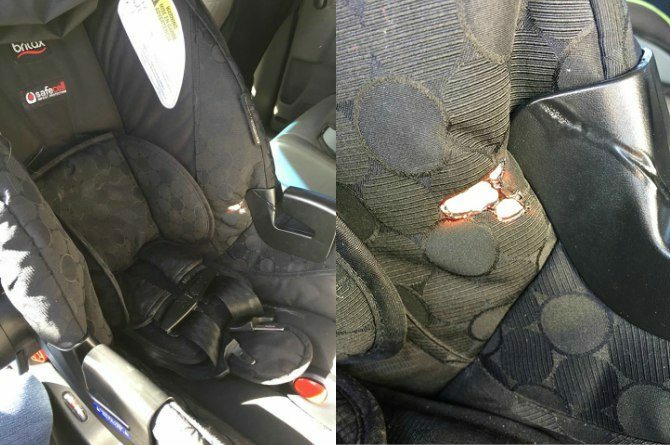 Baby car seat burned: Manufacturer or user error? Others advised the mum to simply be careful where she parks, since this is a natural occurrence. How can you make sure your safety mirror is truly safe? However you feel about this mum’s warning, it never hurts to be extra careful, especially when it comes to your child’s safety in the car. So how should you secure and fasten a car safety mirror? Watch the instructional video below. Another extremely important child safety feature in vehicles is your little one’s car seat. A report by the Straits Times in September 2017 claims that a mere 6% of children in Singapore are restrained properly while inside motor vehicles. This is an alarming statistic, especially considering the number of accidents that happen each year. Though the number of fatal road accidents decreased by 7.6% in the first half of 2017 as compared to the same period in 2016, there is still room for improvement. It should be noted, however, that these accidents aren’t all the result of poor car seat safety. According to Singapore’s Road Traffic Act, children under 1.35m in height are required by law to be secured in a proper car safety restraint. Private-hire cars – Uber and Grab – are also required to carry car seats and booster seats for infants and children. However, this law has yet to be expanded to include taxis and buses. What’s more, parents might find it a hassle to lug around a car seat when they are taking public transport. Do you use a car seat? What do you think about this mum’s well-meaning but misunderstood warning?